The Good Buy Girls Could Be Heading Your Way! Author Jenn McKinlay, who writes the Good Buy Girls series as Josie Belle, totally flabbergasted me by dedicating Marked Down for Murder to me and two other book bloggers. She also sent me several autographed copies of the book, and I'm going to share four of them with you. The drawing begins today, Wednesday, September 10, and it ends next Wednesday, September 17. By Thursday, September 18, I'll put these four autographed books in the mail, and they'll be on their way to the winners. I'll email each entrant to let them know that his/her entry was received. Each winner will be contacted by email to let them know that one of the books is on its way to them. The rules are few, and they're simple-- but be careful! If even one required item is missing, your entry will not be eligible for the drawing! 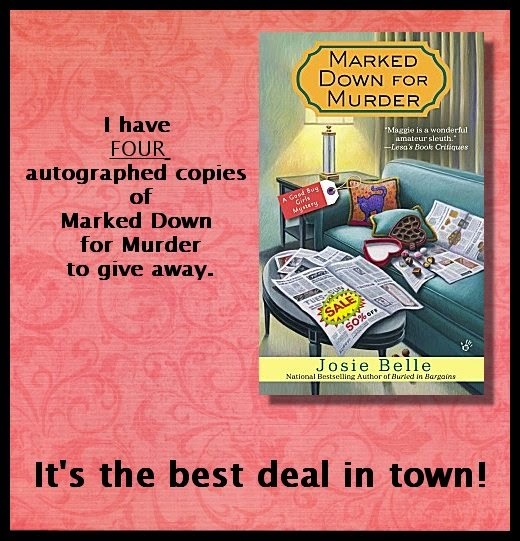 The subject line must read "Marked Down for Murder Giveaway"
The email must contain (A) Your email address, and (B) Your mailing address. That's it! One short and simple email, and you could be one of four winners of Jenn McKinlay's latest Good Buy Girls mystery. Now... who can turn down a bargain like that??? OOooh, a giveaway! Thanks for sharing this, Cathy! You're welcome, Margot. Entries are flying in! Congratulations, Cathy: what an honour! Thanks, Debbie. I'm still in a bit of shock! How much fun is that--having a book dedicated to you! And how nice of you to share. Wow, what an honor!! Congratulations! !